The plane of the day is The Fairchild Republic A-10 Thunderbolt II, which is an American twin-engine, straight-wing jet aircraft developed by Fairchild-Republic in the early 1970s. It is the only United States Air Force production aircraft designed solely for close air support, including attacking tanks, armored vehicles, and other ground targets with limited air defenses. The A-10’s official name comes from the Republic P-47 Thunderbolt of World War II, a fighter that was particularly effective at close air support. 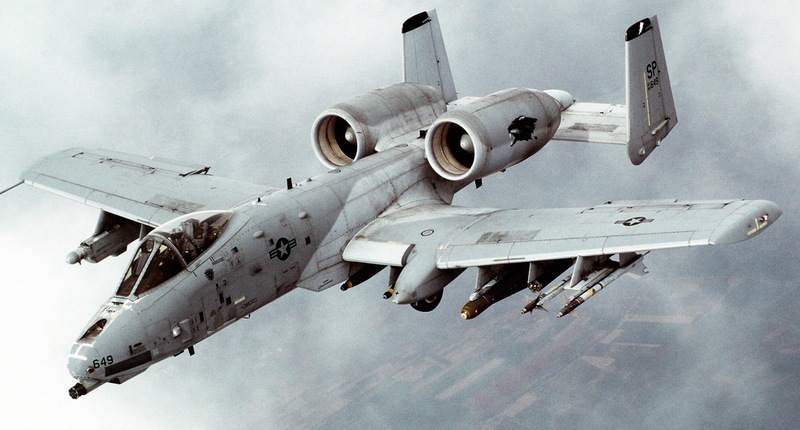 The A-10 is more commonly known by its nicknames “Warthog” or “Hog”. Its secondary mission is to provide airborne forward air control, directing other aircraft in attacks on ground targets. Aircraft used primarily in this role are designated OA-10. With a variety of upgrades and wing replacements, the A-10’s service life may be extended to 2028, though there are proposals to retire it sooner.